A new study warns that more than 100 natural World Heritage sites are being severely damaged by encroaching human activities. The study, led by an international team of researchers from the University of Queensland, Wildlife Conservation Society (WCS), University of Northern British Columbia and the International Union for Conservation of Nature (IUCN) appears in the journal Biological Conservation. Natural World Heritage Sites (NWHS), via the formal process run by UNESCO (United Nations Educational, Scientific and Cultural Organization), are globally recognized as containing some of the Earth's most valuable natural assets. 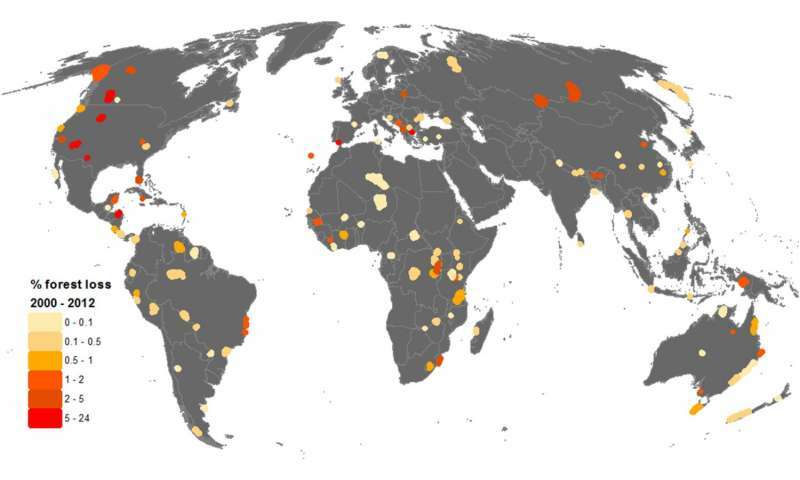 The authors looked at human pressure over time using the updated global Human Footprint criteria, which includes roads, agriculture, urbanization and industrial infrastructure, along with forest loss. They found that the Human Footprint has increased in 63 percent of NWHS across all continents except Europe over the past two decades. The most impacted NWHS were found in Asia including: Manas Wildlife Sanctuary in India, and Chitwan National Park in Nepal; along with Simien National Park in Ethiopia. In terms of forest loss, highly impacted parks included the Río Plátano Biosphere Reserve in Honduras, which lost 365 km2 (8.5 percent) of their forest respectively, since 2000. Even celebrated places like Yellowstone National Park in the US were impacted, losing some 6 percent of its forests. Meanwhile, Waterton Glacier International Peace Park that crosses the Canadian and USA border lost almost one quarter of its forested area (23 percent or 540 km2). "World Heritage natural sites should be maintained and protected fully. For a site to lose ten or twenty percent of its forested area in two decades is alarming and must be addressed," said the lead author James Allan from the University of Queensland. Said senior author, Dr. James Watson of the University of Queensland and WCS: "Any place that is listed as a World Heritage site is a globally important asset to all of humanity. The world would never accept the Acropolis being knocked down, or a couple of pyramids being flattened for housing estates or roads, yet right now, across our planet, we are simply letting many of our natural World Heritage sites be severely altered." By highlighting natural World Heritage sites that are in immediate danger, the study provides useful baseline data for future monitoring and protection. It should stimulate the UNESCO World Heritage Committee, which meets annually to review the status of World Heritage properties globally, to undertake further action to safeguard natural sites in particular. "It is time for the global community to stand up and hold governments to account so that they take the conservation of natural World Heritage sites seriously. We urge the World Heritage Committee to immediately assess the highly threatened sites we have identified. Urgent intervention is clearly needed to save these places and their outstanding natural universal values," said James Allan. Some NWHS such as the Sinharaja Forest Reserve and Mana Pools National Park showed minimal change in forest loss or human pressure, but the authors say they are in the minority.